We are Manufacturer, Supplier & Exporter of Animal Feed Plants, Poultry, Cattle Feed Plants / Mash Plants / Pellet Plants and our setup is situated in Miraj, Sangli, Maharashtra, India. 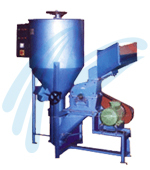 We manufacture Poultry Feed Mills ( Feed Plant and machinery ) both in Mash & Pellet. And that is our USP. 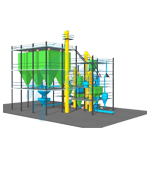 We design, manufacture and Install the Mash & Pellet Feed Plants ( feed mills) for Poultry & Cattle both in semi-Automatic & Fully Automatic systems. Depending upon the daily feed requirement we design the suitable capacity Plants in both Mash & Pellet form with Auto-Batching & Auto Bagging. 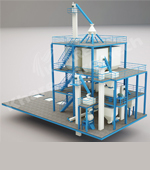 The capacity ranges from 2tph to 12 TPH in Pellet-Crumble plant. For small farmers to produce mash Feed in his own farm we have GRINDMIX H & V Series machinery. 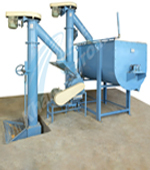 Along with the animal feed manufacturing sector our products/machines ( Full sieve / screen Hammer Mills, Ribbon Blenders, Pellet Mills, counter flow coolers, crumblers etc.) meet the diverse requirements of various industries like Organic Fertilizer, Pharmaceuticals, Paints, Bio mass pellet, Chemical, Sugar & Cement Industries.